European settlers from the wine making regions planted the vines and started wine production. When people settled in the new North American territories, they took with them everything familiar. Those coming from the wine region in Europe, carried grape vines with them, these vines took hold and so the story of wine in U.S.A. began. 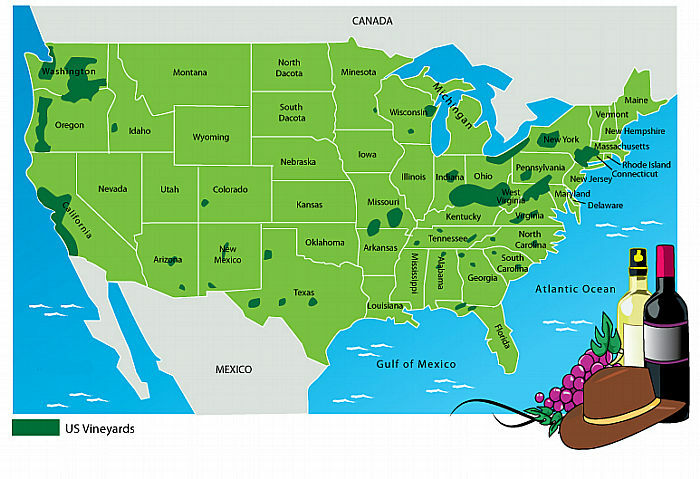 California is responsible for well over 90% wine output in the United States. There are hundreds of wineries thriving in its sun drenched climate and most of them are open to visitors. Considering that a visit to a winery is usually a very welcome change of pace during any vacation trip, there is no harm in planning a whole day touring wineries. Washington is ranked second in the United States by wine production and exports its wines to several countries. Oregon is growing wine, despite a difficult climate and, when weather conditions help, Oregon wine, especially Pinot Noir, raises to the top heights. Get to know the California wine regions before that, and the great northern California wineries at Sonoma, or consider a tour of the Alexander Valley wineries or the California Central Coast wineries. For a tour of small wineries, there is the Madera wine trail. Making wine in Oregon continues to be a challenge, owing to it's largely rainy climate, limited hours of sunshine, cooler temperatures and frequent frosts in the fall. Nevertheless, there are some AVAs and Oregon winemakers raising to important spots in world wine competitions. Truth be told, there are vineyards almost in every one of the United States, but most of them are just local enterprises. New York is the state with a more established wine tradition and there are some notable wine growing areas in Ohio and Pennsylvania. New York has long been a serious competitor to California in terms of quality. Wine in New York state region goes back centuries, since Dutch settlers planted the first vitis vinifera plants.